* The garage door will last longer, since damage is avoided. As a consequence of springs being designed to last for a specific lifespan, they lose tension plus one cycle of their life every time the door completes a full opening and closing movement. With one spring, you will soon have to deal with bearing, cable, and spring problems whereas with a second spring many problems are avoided. The second spring will still have tension to move the overhead door. * If the first spring breaks, the other won't let the door slam down. This is what will happen if there is only one spring and it breaks as the door is descending. In this manner, serious accidents and property damage will be avoided. * With two springs, customers will enjoy more cycle lives. In other words, the springs will last longer. * You don't have to get extra parts for the second spring. The two springs are passed through the same shaft, share the same anchor bracket, and use the same bearing. Installing two torsion springs is not very different than installing only one of them. Once more you have to take all the necessary safety measures for the avoidance of accidents. However, the job is risky and should be left to experts at Garage Door Repair Happy Valley. The opener must be unplugged and disengaged from the door, the door must be opened and c-clamps or vise grips must secure it so that it won't fall. If the existing spring is already broken, you can loosen the cones without fear of accidents, but if the spring still has some tension, must release it first. 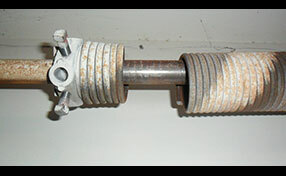 In order to remove the old broken garage door spring and install the two new ones, loosen the cable drum and pull the shaft off the end bearing plate. Now it is time to insert the new springs. If you only had one spring, you would insert it in the shaft and then slide the cable drum before putting the end bearing plate again. Now before you do this last part, you will also insert the second spring. Just make sure the stationary cone goes in first. As you look at the springs from the inner part of the garage, they should be a mirror. The stationary cones must be at the center and winding cones at the end parts of the shaft. Since the wind of each spring determines which way the coils turn, remember to put the right wind spring on the left side of anchor bracket and the left wind spring on the right hand side. 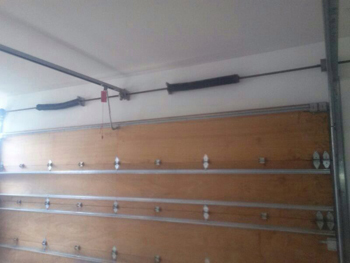 Once the springs are in place and drums in their right position, the garage door cables must be installed and stationary cones must be attached to the anchor. 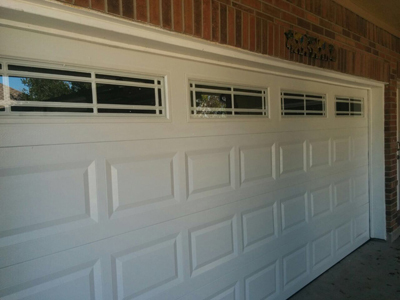 Secure the shaft set screws and wind the springs before reengaging and plugging in the garage door opener again. Verify the door opens evenly and closes all the way or you will have to make some adjustments.